I’m an artist, calligrapher & writer, so I approach pens (and pen reviews) from these angles. I’m also a pen and pencil addict. 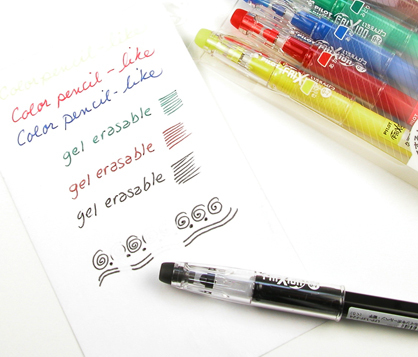 When erasable ink pens first came on the market I felt disoriented. Why would I want to erase ink? I use ink because it is permanent. But I’ve changed, and it is freeing to draw, doodle, and write in ink and know I can erase if I need to. 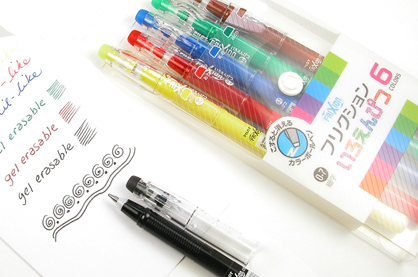 All in all, I like the Pilot Frixion color-Pencil-Like Erasable Gel Ink Pens. Especially for doodling. They erase well, and the eraser is on the end of the pen’s cap, which I like. The pen feels very good in my hand: I like the friction grooves etched into the body. Color: the yellow is too pale to see, the green is a lovely dark forest green. Beware Disappearing Ink (Good for Undercover Ops! ): I was drying a drawing next to paper I’d written on with the pens, and some of the air reached the paper… and the ink disappeared! « CraftArtEdu Dream Jewelry Studio Sweepstakes!